The Bosch LR 6 Line Laser Receiver allows users of the GCL 2-160 Self-Leveling Cross-Line Laser to receive the line further, with precision. The LR 6 makes line laser detection possible at distances up to 165 Feet, and it extends its operation outdoors, in bright-light conditions, or catches beams midair when there is no surface to see the beam on. 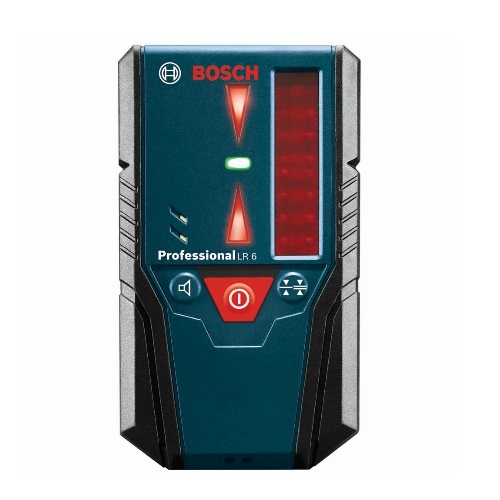 The receiver's dual-sided LED arrow indicators make the receiver more flexible, and it has a volume-adjustable audio signal that give clear on-grade position indication and an accuracy button for fine or coarse adjustment.